IAB held a call to discuss its new State of Viewability Transaction 2015 position paper. In addition to reading out the principles outlined in the paper, Randall Rothenberg, President and CEO of IAB, and Sherrill Mane, SVP of Research, Analytics and Measurement at IAB answered questions from the call participants. Below are the topics addressed along with key insights from the discussion. IAB principles do not specify who should be responsible for covering the cost of viewability vendor services. The issue of fraudulent traffic is outside the scope of the viewability discussion, although these issues do overlap at times. 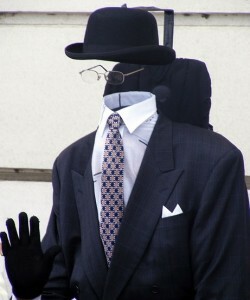 TAG (Trustworthy Accountability Group) was created specifically to address the issues of fraud. The principles apply to desktop (display and video) transactions and do not cover mobile. IAB is not making any recommendations on how viewability should affect pricing. IAB generally limits the principles to measurable impressions – some formats, e.g. sponsorships, cannot be measured and are thus outside the scope. As the position paper specified, the core aspiration of the 3MS initiative was to have 100% of traded impressions be deemed viewable by the MRC. IAB consulted a group with the IAB board (primarily composed of sellers), who have recommended that a 70% viewability rate was achievable at this point in time. 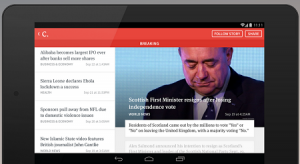 IAB recognizes that 70% will be difficult for some publishers, but they think this is achievable. At the same time if a publisher thinks that they can do better than 70%, IAB encourages them to do so. IAB has cautioned against extrapolating any metrics from the measurable impressions to unmeasurable impressions. As per the example to principle 3 in the published position paper, unmeasured impressions should be billed for as fully viewable impressions (though not contributing towards the 70% viewability threshold for the measured impressions). IAB has assembled an additional group of leaders to monitor the impact of viewability on publishers and course-correct if necessary (as the position paper specified, IAB are looking to revisit the principles at least twice a year). The industry is not yet at a level of sophistication where there can be a standard test suite that is run across all vendors to establish measurement consistency. IAB is working with the MRC and is encouraging its members to share data with the MRC to help them address the variability in measurement rates between vendors. 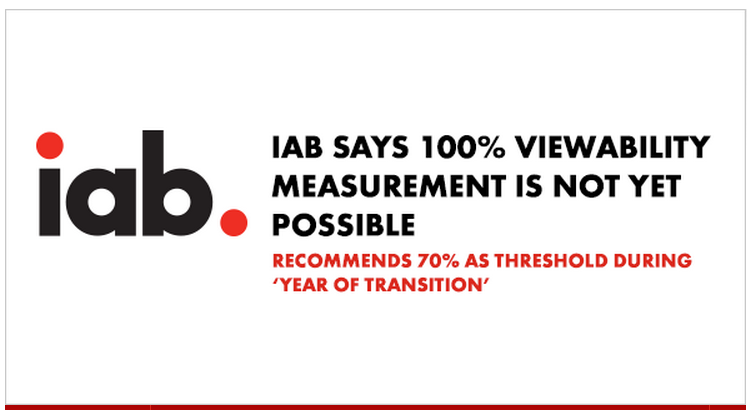 IAB thinks that the 100% viewability guarantees demanded by some of the agencies are unreasonable and will only hurt efforts to collaborate and fixed measurement throughout the system. Asked how IAB would recommend agencies to communicate to clients the endorsement of paying for 30% of inventory that was not viewable, Rothenberg advised agencies to always reference the MRC “Viewability Implementation Considerations”, issued on 16 October 2014, which state that 100% viewability is an unreasonable expectation at this point. Rothenberg advised agencies to educate clients on the current technological limitations of this space and the need to absorb the discrepancies in measurement. While television still dominates video viewing, Americans ages 18 to 64 have doubled their digital video viewing in recent years to nearly 27 minutes a day with almost two-thirds of U.S. adults watching videos online. Given that educated, affluent, and younger Americans are the largest consumers of digital video, it isn’t a big surprise that ad dollars are following these attractive eyeballs. Digital video advertising is growing at a rate of 43.5% year over year. And, by 2017, it is predicted that digital video advertising will make up 15% of the digital advertising market. Video is Everywhere (or Should Be). It’s our responsibility to know our audience, provide engaging solutions across devices, and then optimize delivery based on the real behavior impact each is having. Millennial women want to consume information…on whatever device suits them – tablet, mobile and, increasingly, Connected TV. While the functionality might change based on screen size and capability, the interactions and design should be familiar and cohesive. We conceive of products and experiences as capable of being multiscreen and part of a larger product portfolio / offering. We have the ability to be with our audience all day, every day, everywhere. We are literally in the reader’s pocket. It is incredible. We used to think in terms of one deep experience a day. Now we think about delivering a core reader that deep experience plus making ten other touch points a day. We are holding their hand in line at the grocery store and keeping them company on a long subway ride. There is a shift away from TV to online, set top boxes and mobile. Sooner or later, it will hit a point of no return, where video is not just the domain of what is happening on TV. All of the experiences, from one screen to the next, need to act in concert with one another, resulting in an overall experience that is greater than the sum of the individual parts. 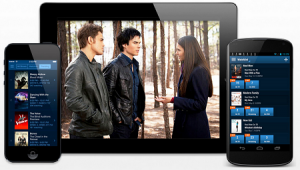 Taking it across four typical distribution paths – TV, OTT, Web, Mobile – will yield a different approach to how the content is developed and produced. Within each of those distribution paths there’s also an additional layer of UX that will inevitably dictate how audiences interact with that content; the key is to be as far upstream and as aware of your goals as possible. When it comes to reaching your audience on a medium like YouTube, you have to be more creative and work with the existing talent. It is still early days for this play in digital video and we are eager to learn from our audiences what they want and what works. That’s the great value digital brings: We get immediate feedback and we can continue to learn and experiment. The entire BI team is involved in creating video now. Find universal, evergreen topics that will appeal to your audience and make videos people want to share. Video is a Millennial Must. Video is a natural communication medium for anyone under the age of 25. We’d be crazy not to do a deep dive into digital video. We know that it is how millennial women want to consume information. Millennials want a seamless, any-screen, digital-first experience with analytics-driven personalization—all priced significantly lower than pay TV. For younger and international audiences, mobile video has been an opportunity for us. We do see that our video skews younger so it introduces new audiences into NYT premium journalism. The Interactive Advertising Bureau (IAB) today released the “State of Viewability Transaction 2015,” a position paper offering the digital media and advertising industries guidance on how to manage the shift of digital media’s “audience currency” to 100 percent viewability. During this ‘Year of Transition,’ the IAB recommends 70% as the best threshold for buyers and sellers (upping the standard from 50%, which the Media Rating Council (MRC) called for in March of this year). To foster stronger collaboration and build trust throughout the entire media ecosystem, the IAB recommends that marketers, agencies, and publishers adhere to seven principles during 2015, which it outlines here. Read the IAB’s entire “State of Viewability Transaction 2015” statement. Given that at 80 million plus, they are the largest demographic in the country, there’s no ignoring the importance of courting the millennial consumer. While they are no more or less mysterious to those in older generations than the young people of any age, they have grown up in a digital world and that has shaped their behaviors and expectations. While most Americans are never far from their mobile devices, 80% of millennials actually sleep with their phones. They also spend almost twice as much time on social media sites. However they also switch their attention between media platforms 27 times an hour. This generation also consumes an unprecedented amount of media, almost 18 hours/day (though much of it is consumed from several sources at once). So while the opportunity—in terms of audience size and quantity of media consumed—is enormous, gaining the attention of this generation and making an impact is certainly a challenge. They are loyal, but not blindly so. Build and maintain trust to attract and engage millennials. 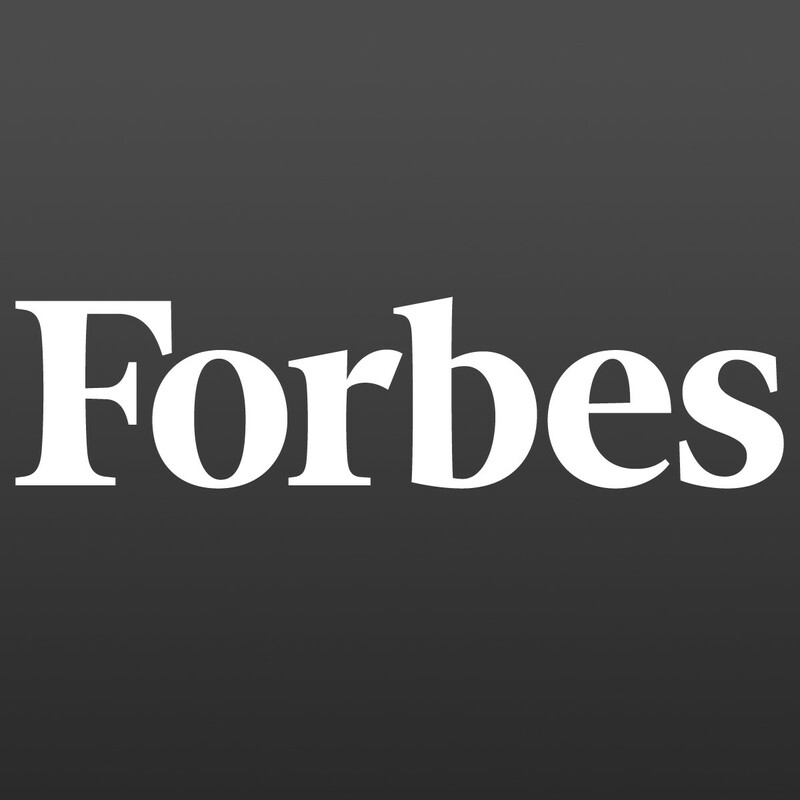 Millennials do have loyalty, but the challenge is in building it. Brands – whether they’re a publisher, beauty brand or tech company – need to be aware of a millennials’ aspirations to live mindful lives. They need to understand the values of millennials and inform his or her needs. Above all else, young people value quality and honesty…What happens when you consistently provide premium, honest stories to your readers? You can create loyalty. Authenticity is paramount. More specifically, having a clear perspective, being transparent, and fostering meaningful dialogue are assets for attracting and retaining millennial consumers. For Millennials, [the] key aspect is trust. Earn trust or die. Millennials are the driving force behind the shift from an attention-based economy to a trust-based economy. They are not passive consumers. Interact to engage millennials. It’s the first generation to be raised in an environment where direct feedback to brands is very, very public. 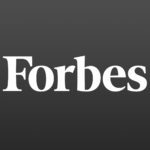 Millennials aren’t just consumers, they’re participants…and they expect to be treated with an appropriate level of respect in that conversation. The explosive growth of social media among millennials is indicative of this dialogue-driven culture shift. Audiences can now connect directly with brands and creators that resonate with them. Most agencies and consultants will tell you that the key to social is listening and responding. That’s a nice start, and listening is necessary, but you have to participate to gain traction and build trust. When it comes to marketing to millennials, don’t. Market with them to succeed. Mobile Matters. Mobile and multiplatform are the foundation of millennial consumption. On Tuesday, the Association of National Advertisers (ANA) and ad-fraud-detection company White Ops, Inc. released the results of their two-month analysis of billions of ad impressions on 36 sites. Research like this is both ambitious and important, and we applaud the effort. Unfortunately, discussions such as these lend themselves to salacious headlines and data analysis can be challenging (and often misinterpreted or even misrepresented, out of context). Our CEO Jason Kint took offense at one such misleading article and we encourage you to read his comments, which were published on Re/code this week. We were also pleased to see that one of our member companies, AOL, also quickly stepped into the fray to help shine a light on this issue as well as what they are doing to tackle the issue of ad fraud. At AOL, combating bot fraud is a top priority. We have several teams that are 100% dedicated to the effort, and we will continue to make significant investments to lead the industry in this battle. Our focus is on creating and integrating the best technologies–both proprietary and best-of-breed through 3rd party partnerships (including the Integral Ad Science, Forensiq, DoubleVerify, MOAT, and more)–that stay ahead of organized criminals. What works today may not necessarily work tomorrow and we cannot let our guard down for even a moment. The fight against bot fraud must remain a multilateral effort 24-7, 365. AOL goes on to discuss its own efforts and to provide resources for those who seek to battle ad fraud, and inform themselves about the issue. Read the AOL article here. Earlier this week, the Information Technology and Innovation Foundation (ITIF) released its 10 Policy Principles for Unlocking the Potential of the Internet of Things. While the report touts the enormous potential for a connected world, it unfortunately misses the point that industry needs to do more to build transparency and choice around data collection before this next component of our digital world becomes ubiquitous. The ability to capitalize on all of the amazing benefits from new technology won’t happen without consumer trust. 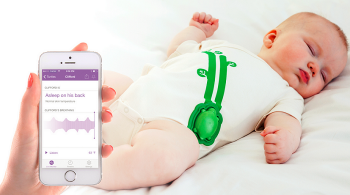 One of the potential consumer applications of The Internet of Things (IoT) that the ITIF study outlines in its report is a “smart ‘onesies’ with embedded sensors that help parents monitor their infants’ health.” I doubt I’m the only parent who would be uncomfortable with a company using data about my newborn without very clear and transparent rules. As a parent, there is no way that I would buy that onesie without some more information about who else could see that data. And, if I started to receive targeted advertising based on my son’s sleep schedule, I would be a little freaked out. The Internet of Things has the potential to alter our lives in amazingly positive ways. However, as with many promising technologies, our industry must set rules of the road for responsible and ethical uses of data. And, we must find ways to provide consumers with transparency and choice about how their data is being collected, used and shared. This is going to be particularly challenging for “devices” that don’t have a screen where consumers can be educated at the time their data is being collected. As a cautionary tale, take a look at digital advertising. Click-through rates for digital ads are astronomically low. Fraud is abundant. Consumers don’t trust that advertisers are using their data ethically. And, increasingly, consumers are going to great lengths to stop it – Ad Block Plus is one of the most popular Android apps and consumers are activating Do Not Track even though there’s no industry standard yet. Advertising isn’t inherently bad and data can be used in powerful ways not only to improve its effectiveness, but to make advertising more relevant and valuable to consumers. However, people have a right to know when their information is collected and in what ways it may be used. That transparency helps build trust. As we seek to take the power of data and the connectedness of the internet and extend it into a wide range of “things” — to make them smarter, better and more effective — we must put trust first. Without trust-based consumer relationships we risk never fully realizing all of the benefits of the world of IoT. 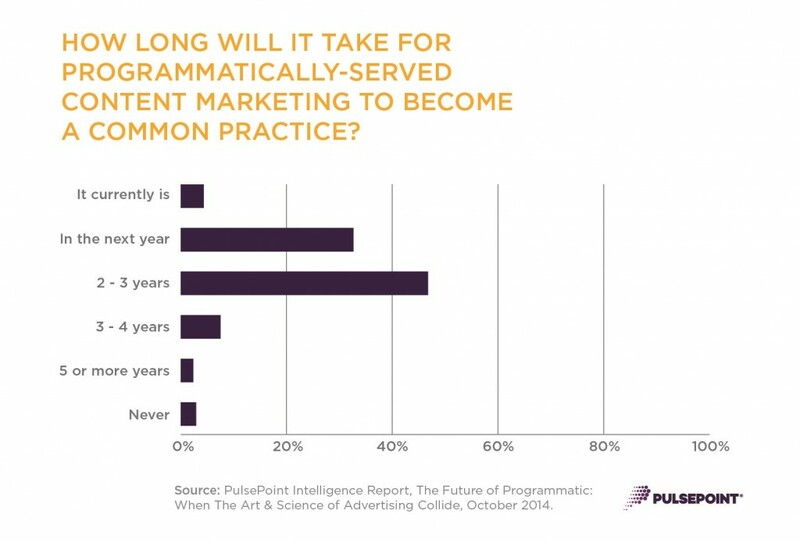 Content marketing and programmatic. Arguably two of the hottest terms in digital today, with more than 370 million Google search results between the two. For the most part, when we think about content and programmatic we think of opposites, of incompatibility, of contradictions. After all, they are used to execute strategies on opposite ends of the marketing funnel (upper vs. lower), deliver against opposite objectives (brand awareness vs. conversions), are measured with opposite metrics (time spent vs. CTR) and are delivered with opposite mechanisms (manual vs. automated). It’s the ultimate oxymoron. However, the future of advertising depends on these two polar opposites fusing together to deliver meaningful brand engagement to the right consumer at more cost efficient scale. CMOs will demand more from their advertising and content marketing will help to fill the current void between the value ads are providing and the value CMOs want. And when content marketing programs are targeted, distributed and optimized programmatically, brands will be able to achieve a higher return on their investment. In a recent report, “The Future of Programmatic: When The Art & Science of Advertising Collide,” PulsePoint partnered with Digiday to survey over 335 industry professionals on both sides of the buy and sell aisle, from agencies and brands to publishers in order to understand how close our theory is to becoming a reality. Is the industry ready for the art of content marketing and science of programmatic technology to finally collide? In short, yes. The research uncovered a strong case for a more creative, more custom programmatic future. Over 83% of respondents believed that content marketing will go programmatic by 2017, indicating the desire for art and science in advertising to collide much sooner than expected. So what’s driving this? Programmatic has been generally confined to lower funnel objectives. But the days of direct response objectives dominating the programmatic landscape are nearing their end. In fact, 71% of respondents thought programmatic technology best supports mid-upper funnel campaign objectives. Additionally, high-impact, custom ad formats will begin to give standard display a run for its money as the proportion of respondents expecting to buy sponsored content placements programmatically in just one year’s time will grow 114%. Respondents also reported that in the next 12 months, the amount of TV bought programmatically will increase 45%, and custom rich media bought programmatically will increase 43%, while digital video will see a 29% increase. This shift could not come at a better time. Nearly every respondent (about 97%) said that either they or their clients are using some form of content marketing and anticipate increasing programmatic ad spend by 62%. We’re excited by these results and are confident that what we once considered to be an oxymoron will soon become the industry norm: rich content served programmatically exactly when and where consumers are ready to engage with it. Nearly 3,000 marketers attended the ANA conference last week and left energized with many new insights from an all-star line-up of speakers. These are the best quotes of the week. Over the past several years, there has been a rush to create ever more digital video content by those you’d expect—traditional broadcast companies such as A+E Networks and NBCUniversal and multiplatform companies like Bloomberg and ESPN—as well as a slew of “print-” or “text-based” companies such as Conde Nast and Business Insider. Yet with companies rushing headlong to heed the siren song of booming digital video viewership and ever-increasing demand for video advertising, it is so good to read a level-headed evaluation of video audiences by way of Chartbeat Chief Data Scientist, Josh Schwartz. When visitors land on a text-based article, in almost all circumstances they read some portion of the article’s content… With video consumption, though, the situation is entirely different: Excepting sites that automatically start videos when a visitor lands on the page, there’s massive attrition between the act of visiting a page with video on it and the act of actually pressing play. Of course, if someone doesn’t even play a video, the quality of the content is moot – we can’t possibly hope to win them over with a video that isn’t watched – so our first goal must be to identify and understand who the best candidates are for pressing play. His piece “Video Production Is on the Rise – But Who’s Watching?” PBS Media Shift is well worth a read for those making a move into, or seeking to optimize their investment in, digital video. According to reports, the FAA is set to publish rules governing the use of small UAVs (Unmanned Aerial Vehicles) or drones which would smother innovation and jeopardize the current uses that provide immense benefits to the general public. The FAA rules reportedly will require full pilot training in a manned aircraft which can cost between $6,000 and 9,000, according to the Aircraft Owners and Pilots Association. Placing high-cost barriers to entry will only hurt innovation – both in the uses of UAVs and the development of safety features in the industry. The FAA rules may also require that the UAV remain within “line of sight” of the operator. This requirement is particularly shortsighted as it would completely shut down one of the most promising benefits of UAVs – their ability to reach areas where humans cannot. There would be very little incentive to innovate around UAVs if the FAA place an arbitrary, regulatory tether on them. News organizations use drones to help with the reporting of news – to fly over war-torn areas, survey environmental hazards. UAVs can get to places where humans cannot or where it would take an extraordinary amount of time and effort not to mention the potential risk of harm. In fact, CNN and the Georgia Institute of Technology are studying the safe and effective use of UAVs for news-gathering. If the news reports are correct, the FAA needs to reevaluate these potential regulations in order to allow for a world where we have safety and innovation. High-cost barriers and arbitrary tethers would stifle technological advances. At the same time, other countries with forward-looking approaches will take the lead in the UAV industry – with investments, jobs and innovation flowing out of America.